Millions of blog posts are published every day. So, before you pour more time and effort into creating content, you need to put serious thought into how you are going to make your blog posts stand out. You need to think strategically and create a plan that will ensure the best return on investment (ROI). That means asking yourself critical questions and giving serious consideration to your answers. In this post, I identify the 5 questions you should consider. When you can answer each of them, you will be equipped to create truly great blog posts that drive real results for your business. Question 1: Why am I writing a business blog? What is your purpose? Because blogging for business isn’t a hobby. It’s not something you do just because you enjoy the writing process. I am sure that when you started writing a business blog, it was because you expected it to help you reach one – or two – or all three of these goals. Having a clear marketing objective in your mind will make you more focused. On top of that, when you have clear goals, you will be better equipped to measure the ROI of your blogging activities. Question 2: Who is my audience? There is nothing duller and more tragic than content that is written for “everyone”. Truthfully, this is a waste of time. You can’t possibly expect to connect with, and engage, readers if you don’t even know what they look like! When you are able to picture your readers in your mind, you will find it much easier to write blog posts that speak to them. Trust me… Knowing your audience is the secret sauce when it comes to writing a business blog. So, who is your audience? Most commonly, you are trying to attract and engage the people who may buy your products or services. Obviously, you want to write blog posts that speak to their needs, their wants, and their interests. When they are online searching for something, you want your blog posts to be the perfect source of information. To do that, you need to be able to picture real people – not just demographics. For example, you may know your product or service appeals to men, ages 45+. But that is too broad a target. I can’t picture someone in my head based on that, and I doubt you can either. You need to go deeper. Create buyer personas for your different audience types. This will help you put yourself in their shoes and consider how your content can help them. 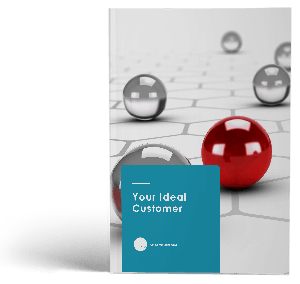 Download the Ideal Customer Worksheet to help you learn exactly who your ideal customer is and how to connect with them online. Question 3: What do I want my readers to do? To answer this question, you need to go back to your objectives. Remember question 1? Whatever action you want readers to take should feed into your business objectives. For example, if you want more leads, you probably want readers to give you their email. If that’s the objective, then your blog post needs a compelling call-to-action. I’m a big fan of free resources. Did you download my Ideal Client Checklist? Did you at least consider it? Don’t just put them at the end of your blog post. Incorporate them into different parts of your post. Make it a win-win situation. Your offer should be a compelling addition that enhances the rest of your post and is useful to readers. Put real value into what you are offering. Nothing is more of a turn off than downloading a “free resource” that is useless. Question 4: What are my competitors doing? To create blog posts that are unique and stand out from the crowd, you have to know exactly what “the crowd” (i.e. your competition) is doing. When I say “unique”, please understand that I don’t mean “never heard of before”. The sheer volume of content going online every day means that every topic imaginable has been imagined – a million times over. When I talk about “uniqueness” I am talking about having a unique perspective. Or a distinct voice. Basically, if you are writing a business blog, you need to make sure your posts are more interesting and creative than what your competitors are writing. If competitors are using tons of industry jargon you might stand out if you pared everything down into simpler terms. If everyone else is focused on text-based content, you could be unique and appealing by adding an explainer video to your blog posts. Don’t just focus on the content of their posts. Look at how individual posts are performing. That intel is super helpful! Study the blog posts that are getting the most traction (i.e. shares, likes, comments) – and the ones that are falling flat. Learn from their successes and their failures. Question 5: How can I write blog posts that both readers and search engines love? To delight readers, you need to create posts that are well-written, relevant, original, insightful, and useful. And don’t forget to make them attractive and easy to navigate! Add images and sub-headings. Use short paragraphs. And make sure those social share buttons are easy to find. Your blog post also needs to be SEO-friendly. SEO (search engine optimization) is about making sure search engines, like Google and Bing, find your post. When people are searching for the kind of information you are offering, you want your blog post to rank high in the SERPs (search engine results pages). Search engines are always tweaking the algorithms. But there are certain SEO principles that consistently hold true. I know what you are thinking… Writing a business blog is hard enough without having to learn a bunch of tech skills. But when it comes to SEO, most of the rules have more to do with writing, post layout, and design than they do with coding and technology. I have already written a great blog post on the subject of writing SEO content. It is a worthwhile read – and the tips I provide are very easy to incorporate into your writing. There are definitely some things to consider before you start writing. Do some serious pondering. But don’t let yourself get bogged down. Once you have answered the 5 critical questions, get your fingers on the keyboard. Blog consistently. Keep learning. And congratulate yourself for your efforts. Because the only surefire way to get better at writing a business blog is to practice!